An Open Access edition of this book is available on the Liverpool University Press website and the OAPEN library. 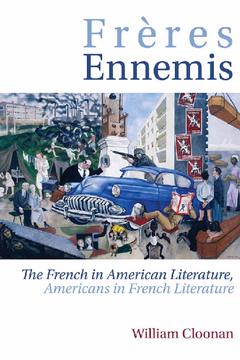 Frères Ennemis focuses on Franco-American tensions as portrayed in works of literature from approximately the mid-nineteenth-century to the present. An Introduction is followed by nine chapters, each focused on a French or American literary text which shows the evolution/devolution of the relations between the two nations at a particular point in time. While the heart of the analysis consists of close textual readings, social, cultural and political contexts are introduced to provide a better understanding of the historical reality influencing the individual novels, a reality to which these novels are also responding. Chapters One through Five, covering a period from the mid-1870s to the end of the Cold War, discuss significant aspects of the often fraught relationship from the theoretical perspective of Roland Barthes’ theory of modern myth, described in his Mythologies. Barthes’ theory helps situate Franco-American tensions in a paradigmatic structure, while at the same time it is supple enough to allow for shifts and reversals within the paradigm. Subsequent chapters explore new French attitudes toward the powerful, potentially dominant influence of American culture on French life. In these sections I argue that recent French fiction displays more openness to the American experience than has existed in the past, and as such contrasts with the more static American approach to French culture. 'I have read with great pleasure Frères Ennemis which treats an original subject in a masterly way. The “close readings” of the texts display a sharp focus that allowed me to discover works I do not know well, ranging from Henry James to Simone de Beauvoir or Jean Echenoz (whom I did not like much before reading this analysis). The trajectory followed incorporates more than a century of literary relations and perspectives which ultimately provide reasons for optimism about future interactions. French myths concerning the States are carefully followed which is fascinating because, to the best of my knowledge, no literary study of this scope has existed on the subject. Jean-Marc Moura is Professor of Comparative and Francophone Literatures at the University of Paris, Nanterre. He has been a Fellow at the Institute for Advanced Studies in France and the Flemish Royal Academy of Belgium. He is currently a member of the University Institute of France and the Académia Europea. In addition to numerous books and articles, he has published four novels. William Cloonan is Richard Chapple Professor of Modern Languages (Emeritus) at Florida State University.